However, if you knew me anywhere from the ages of 13-22, you may immediately recognize an observable difference: I actually have fingernails! For a substantial amount of years, my “nails” were teeny, tiny, sad nubs of weak keratin. I had no whites on the tips whatsoever and had bitten down so far that most people assumed it was painful. 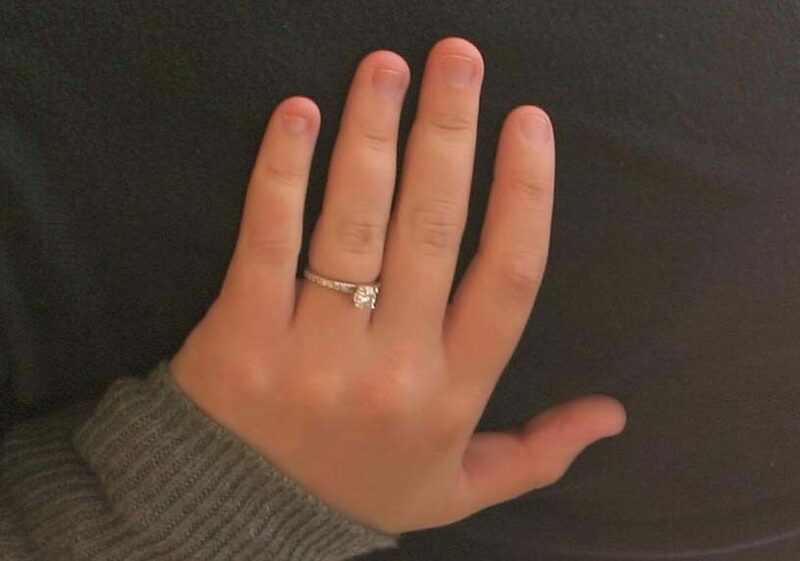 It’s soo cringe-worthy to look back on now; I can’t believe this used to be my hand. The following photo is from our ENGAGEMENT photoshoot, for which I vividly remember trying to grow out my nails. Friends, family, AND strangers would randomly stop and say to me, “You should stop biting your nails”, but I just couldn’t. Not to mention, once they did start to grow a bit, my nails would immediately break or tear, prompting me to bite the rest to nubs all over again. 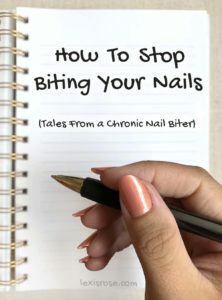 If you are tired of your tiny nubs, tried every trick in the book, and searched the limits of Google for “how to stop biting your nails”, then this post is for you. 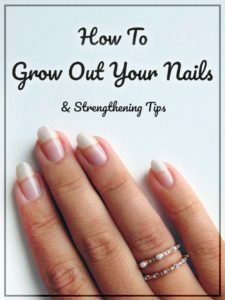 With the methods below, I was able to quit my decade-long nail-biting habit AND grow my nails to a point where they are long, strong and healthy. Yes, you’ve probably tried – and failed – before. I was there, I know. I thought I had tried everything, but I just wasn’t taking the right steps – for me. However, it simply took some introspective reflection, realizing what I was doing WRONG, a solid plan of action, and there I was: a nail-growin’ machine! You CAN stop biting your nails. 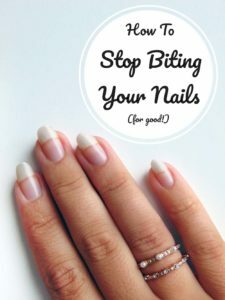 Follow along with my four-step solution to stop biting your nails and grow them out – FOR GOOD. The first (and arguably most important) step to stop biting your nails is to discover your trigger(s). Personally, I had to combat multiple triggers to finally nix my nail habit once and for all. Does boredom cause you to bite your nails? Maybe it happens while you’re on the couch, watching the “Bachelorette” (that finale! the tears! oh my!) Or, while you’re sitting in that evening rush-hour traffic, not moving an inch – ugh! Perhaps you find yourself biting during that boring work meeting that’s taking fo-o-o-rever to end. If you have found yourself biting your nails in similar situations, your trigger is likely boredom! In other words, you bite your nails simply because you need to do something – anything! Usually, this means you can stop biting your nails by finding something else to do with your hands! See “Find Suitable Alternatives – Boredom” below, or keep reading for other possible triggers! Do you bite your nails in situations that make you nervous? If you find yourself chewing off your nails while you’re taking a test, before giving a public speech, or after a tough conversation, you might bite your nails as a coping mechanism for nervousness! In this case, the remedy is finding another channel to relieve your anxiety. I know this is easier said than done, and mental health is not something of which I have extensive knowledge. Always consult a physician with any questions or concerns. However, if it is within your control, make it a practice to engage in calming actions that don’t include the chomping down on your fingernail. We will discuss some quick and easy ways to do so in the following section, “Find Suitable Alternatives – Nervousness”. 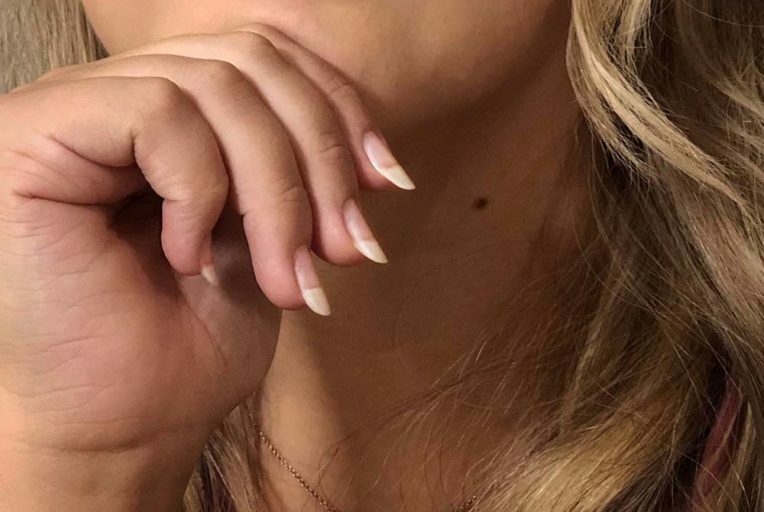 Do you bite your nails to cope with daily stress? For most people, the day to day routine brings certain stresses and worries. 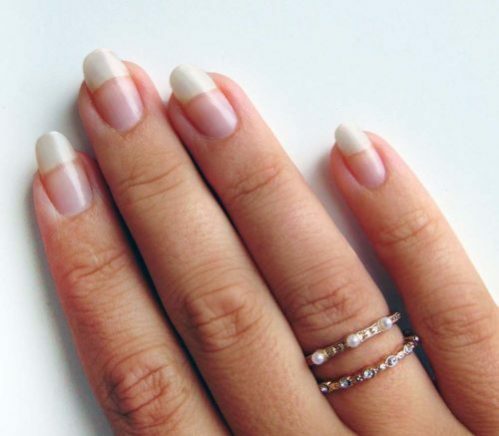 Try to think of when you begin to bite your nails: do these instances coincide with periods of time in your life when you have more stress than usual? If you have reason to believe you feel more stressed-out than the average person, and that causes you to bite your nails, making small life changes to cope with stress can halt your nail-biting habit. Plus, who doesn’t want less stress?! We will discuss some stress-relieving options in the section below, “Find Suitable Alternatives – Stress”. Do you bite your nails to “manicure” them? I had to battle against multiple triggers in order to stop biting my nails, but once I quit, it seemed as if my nails still wouldn’t grow! They were constantly breaking and tearing, so much so that I would resort to biting the rest just to make them all the same size! If you desperately need some strength in your nails like I did (and still do! ), keep reading in the section titled “Growing & Strengthening Tips”. As soon as you get the urge to bite your nails, try focusing your efforts onto some of the suggestions below. Keep in mind that psychologists estimate it can take a minimum of 21 days to make (or break) a habit. If biting your nails is an outlet for your body to fidget or “do something” constantly, simply make a shift to do “something” else. The following are some great suggestions to keep your hands busy. Coloring in a coloring book, note-taking, or mindless doodling. “Playing” with a magnetic fidget puzzle cube like this one; yes, an “adult” version of the super annoying trendy fidget spinner. Braid some strings together, or make bracelets! I found this helpful to distract my hands, but also quite cathartic and relaxing while watching TV. Plus, at the end of it, you have a bracelet! Yay! Chewing gum can keep your mouth “occupied” so that you aren’t tempted to chew your fingernails! In a tense situation, taking a few deep breaths diffuses some temporary anxiety (like when taking an exam or trying to fix a frustrating work issue). Apple smart-watches have a built-in “Breathe” app, or you can download one on your iOS or Android phone. This will give you a moment to focus on individual breaths, allaying any sudden anxiety and stopping the urge to bite your nails. Carrying a small stress-relieving ball can be a simple way to fight your nerves – and the physical stimulation will keep your fingers away from your mouth! Extra bonus! When you begin feeling those nervous “butterflies”, try counting backward to zero, from fifty! Alternatively, try to hum a small snippet from your favorite, upbuilding song. Give yourself a mini-massage! The next time you feel the urge to bite your nails, roll your hands or feet back-and-forth on a golf ball, or your back on a tennis ball (use a wall or door to apply pressure and hold the ball in place). Releasing some tension can help calm nervous muscles. Not all nervewracking situations can be planned for, but if a special event is causing some anxiety, make sure you are prepared! Getting a sufficient amount of sleep the night before, picking out a special outfit, and arriving early can greatly reduce the amount of nervousness you feel. My cure for daily stress was (and still is) simple self-care. Participating in a daily exercise routine, drinking plenty of water, and eating smarter (healthier) really enabled me to handle and process stress better. These may seem like large changes to make all at once, but you don’t need to be intimidated. Start slowly, and soon these good habits will take the place of the less favorable one. For example, beginning a daily exercise routine doesn’t mean breaking the bank on a gym membership. Aim to do one fifteen-minute online workout each morning or evening – whatever works for you! I was always relatively active, but once I made a promise to myself to exercise regularly, I experienced so many positive changes! You can download an app to track your water intake, or buy one of these cool water-intake bottles! It sounds simple, but so many studies confirm that cutting out sugary drinks and replacing them with pure water helps to relieve stress! 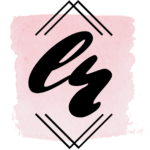 One other tip that really made a difference with my self-care? Cleaner eating. I’ll admit, I was a sugar- and carb-aholic. Incorporating more whole foods into each meal (and less refined sugar) not only made me physically healthier, but my moods and overall well-being improved, too. Once you learn to keep day-to-day stress “in check”, you may notice that it will become easier to stop biting your nails. BONUS TIP: Seem extra stressed-out lately? Make sure you are keeping a regular sleep schedule. You can even use an app on your phone to make sure you are getting a sufficient deep sleep. Choose a reasonable period of time to not bite your nails, and, if you succeed, treat yourself to a manicure! 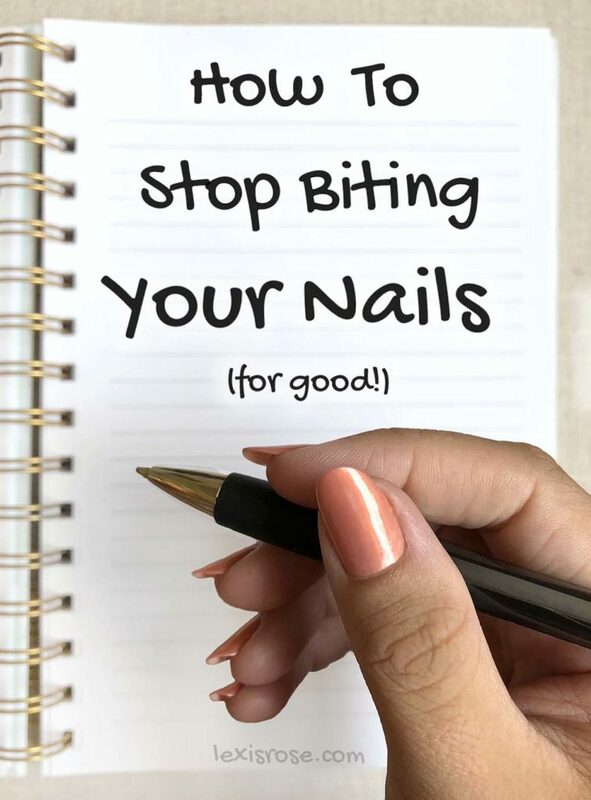 Plus, once you have your nails done, you may be less inclined to bite them and ruin the polish! Added bonus! Here’s a mani I did on myself with new nail polish! Perhaps you can try setting up a “splurge jar”. For each day that you go without biting your nails, add fifty cents. However, if you bite your nails, you lose a dollar for that day! Save up to a “splurge” that you normally wouldn’t have bought yourself, like that new Kylie Lip Kit! Remember, failures are part of a journey, so try notto dwell on the setbacks; move on and move forward! Be TENDER on your nails! Mundane, daily activities can unsuspectingly undermine your efforts to strengthen your nails. As you go through your day, pay attention to exactly how tough you are on your hands! Washing dishes? Use a sponge or steel-wool pad instead of picking at tough grime with your nails. Trying to remove a sticker/tag? Soak it in water and rub it off with the pads of your fingers. Use the same method when scratching an itch or washing your hair! Try to do everyday tasks a little more deliberately, as opposed to just throwing your hands to and fro. Concentrate just a bit on where your fingers land to avoid catching nails with some new length on sharp or rough surfaces. Basically, the less stress put upon your nails, fewer breaks/cracks/tears will occur. 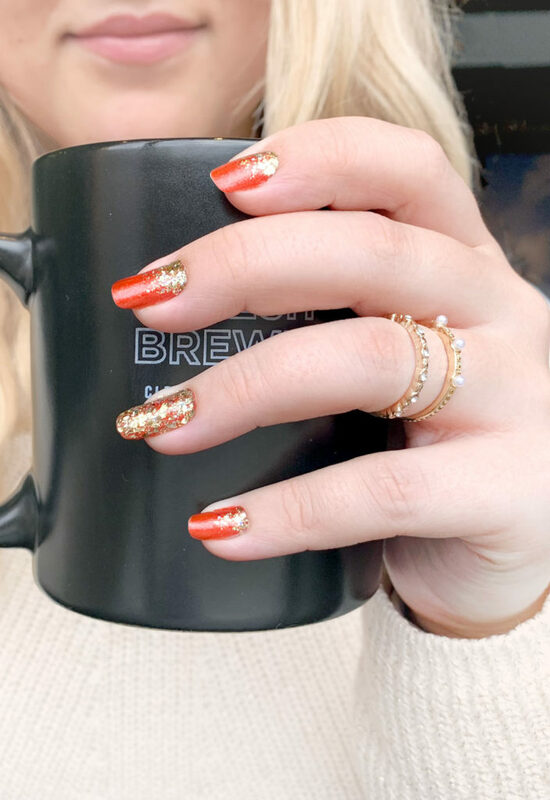 Show your nails some LOVE! Hands-down, this strengthener was what helped push me through to the finish line in terms of quitting the nail-biting habit. I started with Nailtiques Formula 2, which is recommended “for soft, peeling, bitten, weak, or thin” nails. It is a clear polish, packed with healthy proteins and strengtheners, to be applied to bare nails once every one or two days until “the desired results are achieved”. And – oh my word – let me tell you guys! Within just a few days, my nails were longer, stronger, and smoother than they have ever been! I literally swear by this stuff; it is worth every penny. This combined process has seriously saved my nails. Plus, now that my nails are growing out healthy and strong, it greatly reduces the urge to bite them. This nail strengthener was that one thing that I needed to help kick the ever-recurring nail-biting habit – for good. 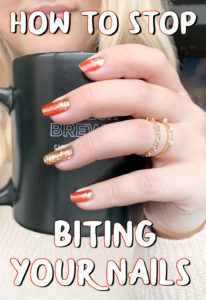 If you’re done with bitten, brittle, or broken nails, you can click on the linked text (red) to find it on Amazon and try it out for yourself. You won’t regret it! CARE for your nails and fingers! One important aspect not to forego is the maintenance of your cuticles! In case you didn’t know (because I didn’t), the cuticle is a thin piece of skin that connects and covers your growing nails. A healthy cuticle will prevent bacteria from getting under your skin, which could damage (and subsequently weaken) new nails. This simple fact blew my mind: if your cuticles aren’t kept moisturized and healthy, your nails pretty much have no chance of being strong – right from their start! I began using a cuticle oil (like this one) right away! 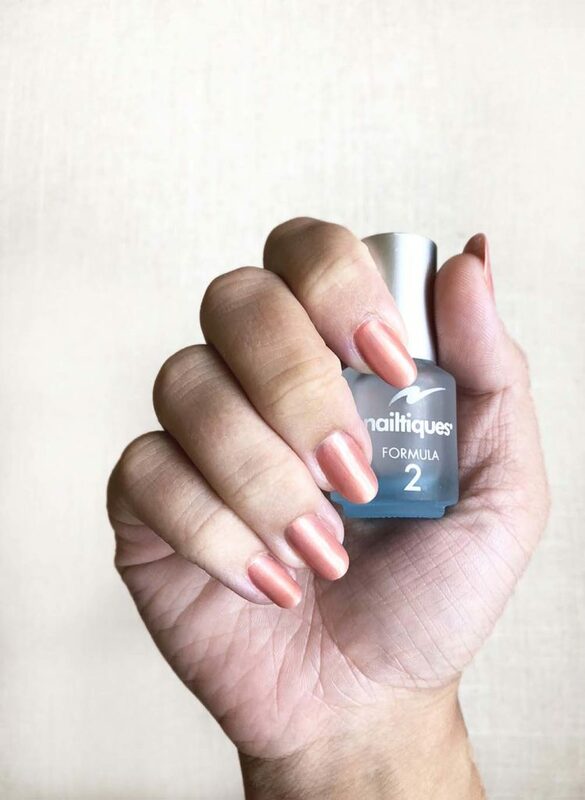 The results aren’t as obvious at first, but strong nails need to start somewhere – and that “somewhere” is under the cuticle. Protecting and moisturizing the cuticles keeps your nails healthy and strong from the beginning so that they can grow longer and healthier down the line. And please, don’t even dare to pick your cuticles!! Are you ready to stop biting your nails once and for all? Following the outlined plan and tips above will ensure your success! Don’t be afraid of setbacks – they will come along. However, the steps taken afterward are what will lead to your ultimate triumph! And, trust me – nothing feels better than that moment when you look down at your long, strong nails, and realize just how far you’ve come. Leave me a comment or send me an email if you have any questions on my story or the process to quit biting your nails! I know this process will help you as much as it has me. As always, thanks for reading! Feel free to share or reblog this post if you know someone who could use the information, or Pin one of the images below to come back later! Don’t forget to find me on Instagram so we can keep in touch, and enter your email below to receive notification of my next blog post like this one! I use to bite my nails all the time growing up. I hated it. My problem was that I was mainly bored or thinking about my next step. Then one day, I decided to get a manicure. I kept the manicure for as long as I could. I didn’t want to destroy the beautiful work and have nail polish in my teeth. Eventually, I stopped biting my nails. I still bite my thumb nails on occasion but my nails are nice and healthy now. Great job!! So glad to hear another success story! 🙂 The manicure trick is a great way to start! I have been biting my nails for as long as I can remember. Growing up, that’s all I ever did and still do and it is truly my worst habit. I want to stop, of course, but it’s hard and I’ve tried absoultly everything that’s out there. But I feel like these tips might work and I’ll give them a shot. Really good tips Lexis! My nails are just weak, I’m not a nail biter, so I appreciated your tips for being mindful of what I do with my hands. Thank you! Love it!! Great ideas anyone can use for mindless boredom!